Ireland should make public its rules governing police use of force. Irish common law appears to require conduct that complies with international legal standards, including for use of firearms. the state shall, in particular, by its laws protect as best it may from unjust attack and, in the case of injustice done, vindicate the life, person, good name, and property rights of every citizen.Art. 40(3)(2), 1937 Constitution of Ireland (as amended through October 2015). the dwelling of every citizen is inviolable and shall not be forcibly entered save in accordance with law. Art. 40(5), 1937 Constitution of Ireland (as amended through October 2015). There is no constitutional provision relating to law enforcement or the Irish Police, known as the Gardai (An Garda Síochána), which were first established in 1923. A member of the Garda Síochána may use reasonable force in order to compel a person to comply with a requirement to stop a vehicle, and such force may include the placing of a barrier or other device in the path of vehicles.S. 8(3), 1976 Criminal Justice Act. In February 2018, it was reported that pepper spray had been used by the Gardai more than 500 times in 2017, which is almost double that of the British Metropoitan Police Service. "Pepper spray used by gardaí over 500 times in 2017. Met Police and other UK forces use Tasers, which are not widely available to gardaí", The Irish Times, 19 February 2018, https://www.irishtimes.com/news/crime-and-law/pepper-spray-used-by-garda%C3%AD-over-500-times-in-2017-1.3398022. 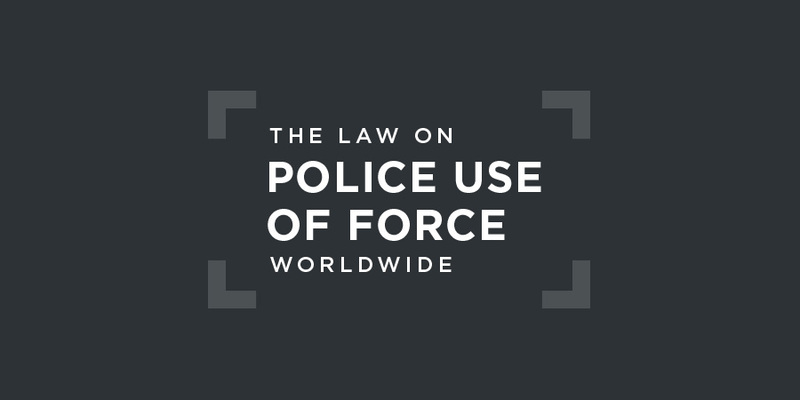 Excessive use of force that does not result in death may amount to assault or assault causing harm or serious harm: a violation of Sections 2 to 4, respectively, of the 1997 Non-Fatal Offences against the Person Act. There are no specific legal provisions on use of firearms by the Gardai, which is predominantly an unarmed police service. Instead, the law provides an exemption from licensing requirements under the various Firearms Acts for a member of the Garda Síochána when on duty.Darren Martin, "The guard and the gun", Garda Review, 27 May 2016, http://www.gardareview.ie/index.php/the-guard-and-the-gun/.To be lawful, however, the individual Garda officer must honestly believe that there was an immediate and real risk to life and that the use of lethal force was justified in the circumstances. The Garda Síochána Ombudsman Commission (GSOC) has the mandate to oversee use of force by the police and to investigate complaints of excessive use of force. Together with the Policing Authority and Garda Inspectorate, it provides oversight of policing in Ireland. As noted below in the section on caselaw, the United Nations Human Rights Committee and the Committee against Torture have questioned the independence and effectiveness of the GSOC. In September 2018, the national Commission on the Future of Policing in Ireland decided on the establishment of a new consolidated oversight body. at the ability of the Garda Síochána Ombudsman Commission to function independently and effectively, and at the requirement for approval from the Minister of Justice to examine police practices, policies and procedures, and the length of time taken to complete investigations due to lack of cooperation by the police.Human Rights Committee, Concluding Observations on Ireland's fourth periodic report, UN doc. CCPR/C/IRL/CO/4, 19 August 2014, §13. to strengthen the independence and effectiveness of the Garda Síochána Ombudsman Commission. It should also ensure that the proposed establishment of the Garda Síochána Authority does not encroach upon or undermine the work of the Commission, but rather complements and supports it.Human Rights Committee, Concluding Observations on Ireland's fourth periodic report, UN doc. CCPR/C/IRL/CO/4, 19 August 2014, §13. The capacity of the Commission to function independently and effectively and to investigate allegations of torture and ill-treatment, including because of financial and staffing limitations.Committee against Torture, Concluding Observations on Ireland's fourth periodic report, UN doc. CAT/C/IRL/CO/2, 31 August 2017, §19(a). Strengthen the independence and effectiveness of the Garda Síochána Ombudsman Commission to receive complaints relating to violence or ill-treatment by the police and to conduct timely, impartial and exhaustive inquiries into such complaints.Committee against Torture, Concluding Observations on Ireland's fourth periodic report, UN doc. CAT/C/IRL/CO/2, 31 August 2017, §20(a). provide, by 11 August 2018, information on follow-up to the Committee’s recommendations on ... strengthening the independence of the Garda Síochána Ombudsman Commission.Committee against Torture, Concluding Observations on Ireland's fourth periodic report, UN doc. CAT/C/IRL/CO/2, 31 August 2017, §37. There has, to date, been no case against Ireland involving police use of force that has been concluded with a finding of a violation. As noted below, The MacLochlainn Commission was established concerning an alleged violation by Ireland of the 1950 European Convention on Human Rights based on Ireland's failure to conduct an independent investigation into a fatal police shooting in 1998. The decision in Nic Gibb v. Ireland is available for download below. The Barr Tribunal (the sole member being Justice Robert Barr) was tasked with investigating the facts and circumstances surrounding the fatal shooting of John Carthy by members of the Gardais at Abbeylara, County Longford on 20 April 2000. Mr Carthy was suffering from serious mental health problems. An Emergency Response Unit (ERU) team from Dublin was present along with ordinary Gardai officers. The Tribunal published its report in 2006, concluding that serious operational and systemic failures had occurred, and recommending that an urgent review be undertaken of Gardai command structures for dealing with sieges; that greater expertise and training in dealing with people with mental illnesses was urgently needed, and that the ERU be equipped with less-lethal options, including an attack dog unit. In 2010, a complaint was made to the Garda Síochána Ombudsman Commission by a man who alleged he had been assaulted by police in the course of his arrest. The GSOC investigation led to a 2013 report that recommended prosecution of four Gardai officers. This was the first prosecution by the Department for Public Prospections following an investigation by GSOC to result in custodial sentences for (three of the four) gardaí. The MacLochlainn Commission was established in August 2014 to undertake a thorough investigation of the fatal shooting of Mr Ronan MacLochlainn by members of the Garda Síochána in the course of an attempted armed robbery of a Securicor van in Co. Wicklow in May 1998. The Commission of Investigation arose from a case taken by Mr MacLochlainn's partner to the European Court of Human Rights concerning an alleged breach by Ireland of the European Convention on Human Rights owing to a failure to conduct an independent investigation into the shooting. The Court struck out the case on foot of an undertaking by Ireland to establish a Commission of Investigation. The Commission's report, which was published on 20 December 2018, found that the shooting of Mr MacLochlainn was legally justified, but it identified serious deficiencies in the Garda investigation of the shooting, as well as in relation to record keeping, the disclosure of information, and other matters. In September 2018, Ireland's Commission on the Future of Policing presented its report. It decided that a new body, the Policing and Community Safety Commission, will supersede both the Policing Authority and the Garda Inspectorate. Under the Commission’s proposals, the new body will investigate incidents and not only individuals, to find fault where appropriate, and identify lessons for the organisation. It will carry out all investigations itself, so that police will no longer be investigating themselves as is now sometimes the case. The Commission also called on the Police to develop a plan to deploy body-worn cameras. It had also been expected to offer recomendations on less-lethal weapons, especially tasers, but did not do so.